So, maybe this is a little weird, but I have a minor fixation with....old men. Whenever I’m walking in the park or down a small backstreet and discover a supreme little old-man hangout—I don’t know, something about it just brings out the deedle in me. Perhaps it’s because they are the best living reminder of the same genuine Paris that comes out in the cobblestones nestled among cracks in the asphalt. Their gestures, their camaraderie, their penchant for spending day after day utterly immersed in the same conversations and simple pastimes—all make me think one thing: these are the original bros.Looking at these people it’s strikingly clear that their mannerisms and their activities have all been transported, more or less perfectly intact, from a decade or a century or an era ago. 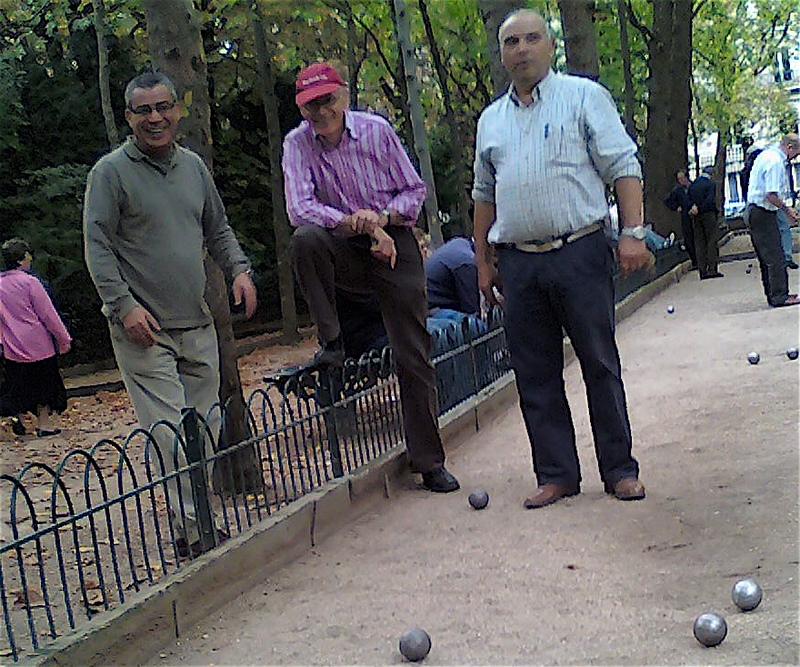 One of the most perfect examples of this is the daily drama that unfolds with high tension on the Boules court on the west side of Jardin de Luxembourg. 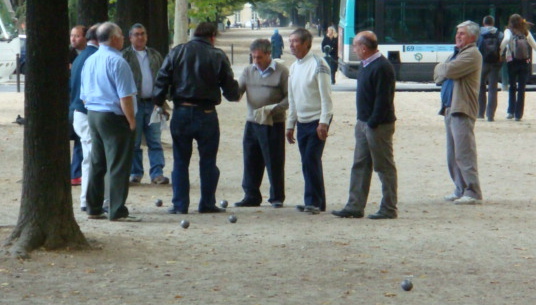 Boules is a game exactly like bocce—it involves throwing a tiny wooden ball (the cochon) onto an irregular dirt surface then competing in teams to get the heavy metal boules closest to it. I came here recently on a chilly fall day and to watch the game. It was every bit as thrilling as watching Olympic speed-skating. First, it’s a real spectator sport: for each of the dozen or so guys actually involved in the action, there are another two or three scrutinizing on the sidelines—making hushed but intent side conversation to their companions about a certain guy’s throwing form, or his knocking strategy, or the past month’s worrying decline in his performance. Then of course are the players themselves, who have with years of practice honed not only their ball-launching angle and body position but also the variety of exquisite facial expressions and expletives that come along with each of the game’s possible failures and successes. There’s the look of utter disgust when a shot doesn’t go perfectly on-target; there’s the self-satisfied look after a ball has been thrown with laser-like precision to knock opponents’ material out of play; and there’s the look of feigned nonchalance when one’s own boules have been similarly taken down by an opponent. And these guys live for this game. Here’s a guy I spoke with, well over ninety, who has been coming here regularly, rain or shine, for the past twenty-five years. His body has permanently adopted the precise hunched-over shape that he has when taking his throw. And with an intense game come intense rules—and intense equipment. First of all, one wouldn’t THINK to step foot on the boules court without the necessary magnet-attached-to-string contraption that allows a person to collect his balls at the end of the round without having to do such an unthinkable thing as bending down to pick them up. Second, there is the variety of measuring devices. String, plastic compasses, measuring tape, foldable rulers, retractable plastic strips—all are used with careful planning and consideration, depending on the need. There’s no WAY, for example, that a simple string or ruler will do the trick once you’re within the 10-centimeter distance—a precise folding compass must be used to ensure accuracy. And even then, somehow every now and then people still manage to get so pissed off over some unimaginable ambiguity in the rules or the measurements that they look like they will come to blows. This isn’t just ANY pass-time, you know. This is high stakes. People’s honor, self-respect, and social standing all hang in the balance with every flick of the wrist and toss of the arm. Oh, to be old, and to have the drama of the day consist of these trivialities. It’s enough to make you look forward to retirement.